CentraXX Basic – Scientists working today to combat major widespread diseases need an up-to-date work environment including technical equipment. This is the only way their research results can remain at the forefront of progress. The establishment of the six German Centers for Health Research (DZG) created the interdisciplinary and inter-institutional basis for Translational Medicine in Germany. The aim of these centers is to be able to offer patients new medical therapies and products more quickly in the future. The active, barrier-free and constant exchange of information between medical treatment and research is the first required step for translating laboratory research results to modern medical treatment more quickly, or even at all. It is therefore essential that new system IT solutions be developed to surpass the strict requirements, create new potential, and be put to use. The world of medical IT has experienced a significant imbalance in up-to-date IT solutions. Until now, there have been many IT solutions and providers developed for the side of clinical care (e.g. for the HIS/CWS systems that are required in hospitals), but virtually no suitable IT solutions developed for the research side. New developments in science, clinics and industry must be brought together to develop new methods and tools to advance the capabilities of medical treatment: everywhere from prevention and diagnosis, to individualized treatment, and finally, to personalized medicine. Technically outdated, often isolated, sometimes designed for other uses – IT solutions such as these are found too often in today’s medical research. These solutions cannot be easily integrated into this structure of an up-to-date information network. Yet system interoperability alone is not the answer. In addition to a lack of uniform programming standards and a wide variety of interface requirements, a lack of a uniform cross-platform vocabulary (keyword: Data Dictonary) and a common interpretation of the data (keyword: Meta Data Definition) are major practical challenges when networking different locations or system solutions. In addition, most existing primary and secondary systems were neither developed for storing nor for retrieving the rapidly increasing amount of (unstructured) data. With the CentraXX software product, KAIROS offers a biomedical research portal that has already anchored the principles of personalised medicine into its product DNA. The CentraXX research portal focuses on the structured recording of research content using the biobanking and study management modules. In particular, the connection to the treatment data is established by means of a comprehensive data capturing pipeline. The provision of treatment data for research in particular reveals new contexts of meaning. 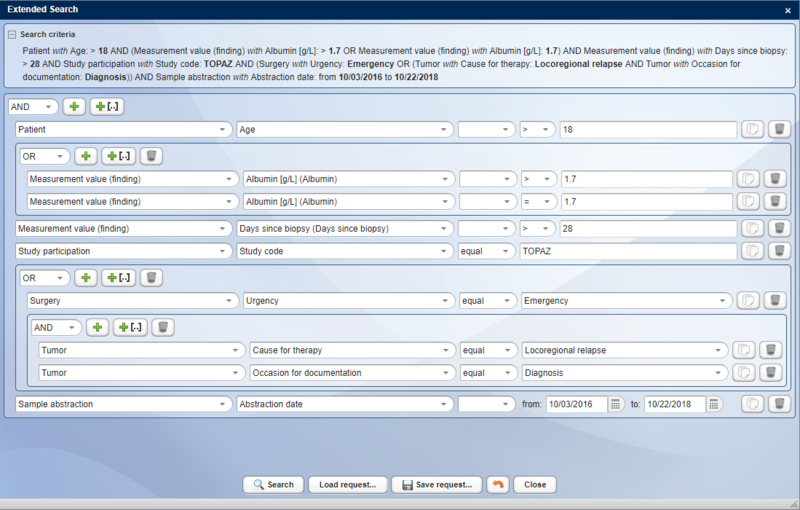 Thus, important evaluations – such as the comparison of patients with similar cases – can be offered via the portal. Characteristics such as age, diagnosis, therapy, pathological descriptions and laboratory values are no longer sufficient to compare diseases in the context of personalised medicine. Therefore, a research portal must integrate the OMICS procedures. IT-supported predictions and therapy suggestions can then be made from this symbiosis. KAIROS has implemented a certified QMS according to DIN EN ISO 13485 for the development of medical products. Research data can only be returned to the treatment process via this path, which is specified in accordance with DIN EN ISO 13485. And this cycle is the basis for a promising personalized medicine. The EPR (Electronic Patient Record) is the central storage unit in CentraXX. All sample information collected in CentraXX Bio and all study data collected in CentraXX Trial to registered CentraXX patients/trial subjects are embedded into the EPR. Thus CentraXX offers the acquisition of longitudinal patient data and is not limited to static data “snapshots.” Besides sample and study information of an individual, further structured data from diagnoses (e.g. ICD10), procedures (e.g. OPS), episodes (e.g. inpatient stays), medication, consent, virtual microscopy, hotline, etc. are combined in the same file. Furthermore, documents of any kind (e.g., signed consent forms) can be uploaded to the research file. In addition to the CentraXX standard masks for recording patient- and sample-related data, the embedded Form Engine offers the possibility of flexible creation of forms for the recording of all additionally required documentation points. Measurement profiles consisting of measurement parameters of various types can be designed in the User Interface. All data entered in these forms can be found ad hoc with the Query Engine in CentraXX. CentraXX offers the possibility to create and manage different user groups. Users with different rights can be created and managed in the system, from the attending physician to the research student. Each user can be assigned an email to enable password recovery, notifications of new tasks in the system or submitted reports. Users can also be data trustees, enabling them to match pseudonymized IDs with identifying IDs and access audit tables in specific fields (e.g., sample handling and measurement results). A user can also be linked to a patient in the system. Thus, a patient could register directly with CentraXX and fill out forms (e.g., for self-reported outcomes). Furthermore, a patient can view his/her data that is collected in CentraXX. CentraXX allows client separation by grouping patients and samples into organization units. In contrast, all users are assigned to organization units, ensuring that patient groups are removed from the view of users without appropriate access rights to these departments. Sample material and the analysis results obtained can also be separated according to organization units. CentraXX enables larger institutions to collect data on the same patient across departments without fear of unauthorized access to sensitive data. CentraXX offers an integrated pseudonymization service. All identifying patient data is stored in a separate database. Users can have access to patient records without being allowed to see any identifying data. CentraXX offers various strategies to meet the strictest data protection guidelines. For example, it is possible to integrate external trustees and synchronize completely separate CentraXX instances to ensure that no identifying data can ever be viewed by unauthorized personnel. Each user in CentraXX is assigned to at least one organization unit. For each organization unit, the user has a role in which the access rights for this organization unit are defined. With the rights and role management in CentraXX, in which areas a user should have read or write access can be defined down to the level of detail. In addition, it is possible to remove complete modules or included functionalities completely from the user’s view. All data stored in CentraXX can be analyzed. CentraXX offers the integration of BIRT for this purpose. 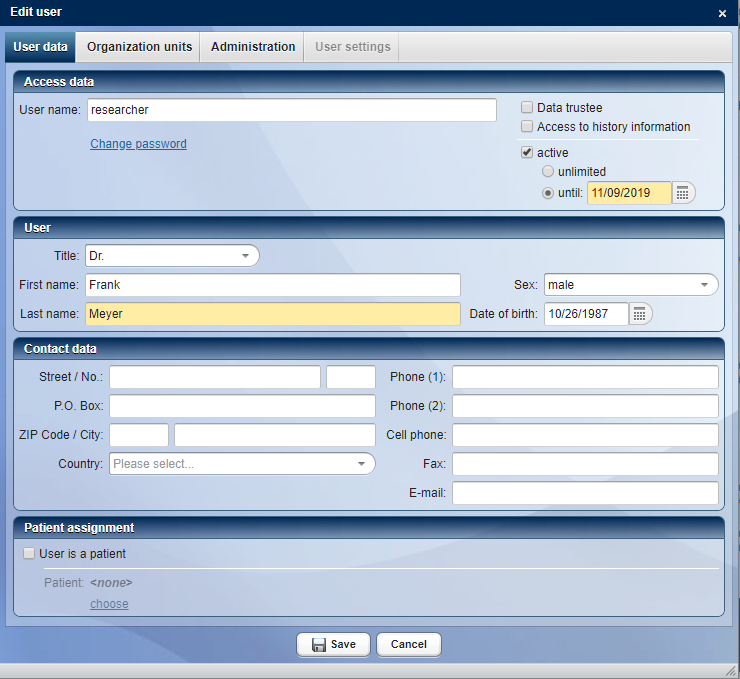 With BIRT templates all data fields in CentraXX can be searched, evaluated and graphically displayed. 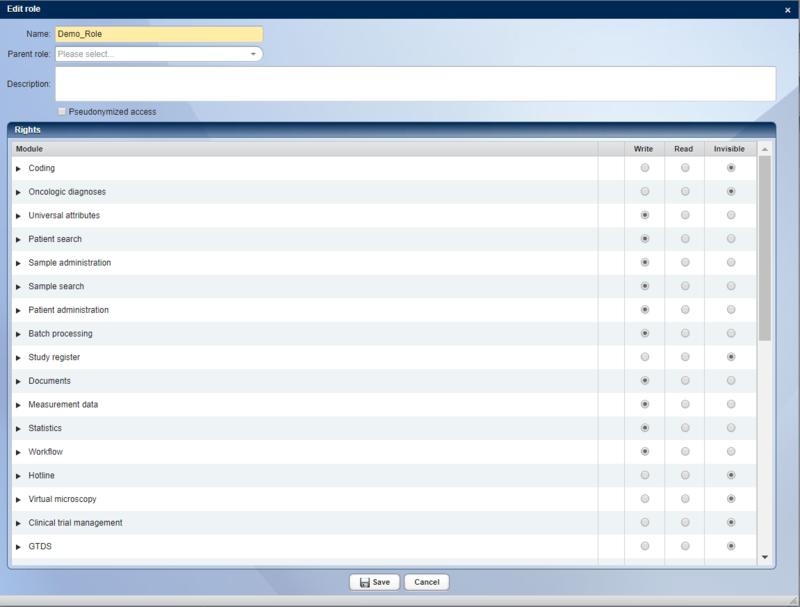 There are export options for reports via CSV or PDF. Reports can also be created automatically and sent to specific recipients by e-mail at definable intervals. In addition to the Basic Search, CentraXX offers the possibility to use the Advanced Search, which is based on the Elastic Search technology. This separately hosted search server connected to CentraXX offers significantly higher performance and some advanced search functionalities that Basic Search does not provide. Advanced Search is particularly recommended for larger customers with many and complex queries. The integrated Workflow Eengine allows the creation of system-integrated processes in CentraXX, in which flexibly configurable documentation masks with defined rules can be put to use. Thus SOPs can be modeled into CentraXX to make data acquisition more efficient, transparent and less error-prone. Certain work steps can be processed in parallel by using the Workflow Engine. All logic (e.g. validation, branching, etc.) can be implemented with the Workflow Engine. A CentraXX workflow can be used anywhere in the system, whether in the Bio or Trial module, in order to implement internal SOPs into CentraXX supported documentation steps. This means that all processes in the laboratory or in the study documentation can be managed with tailored solutions. The Workflow Engine is based on jBPM technology. 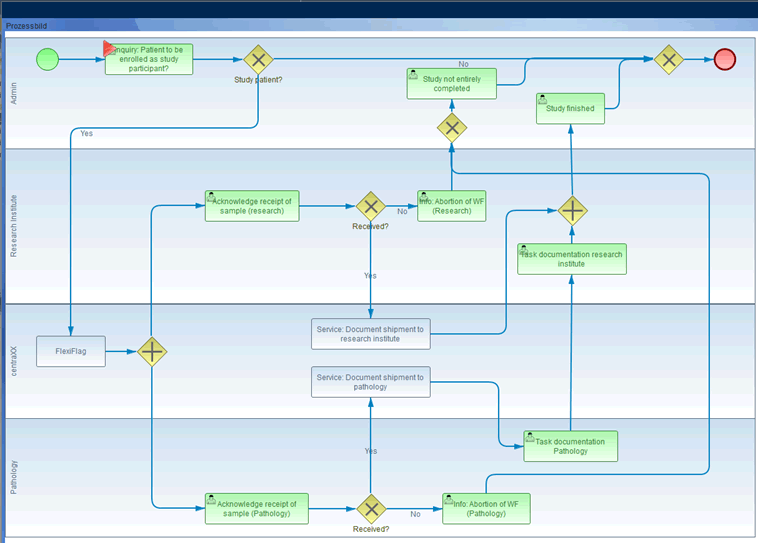 If internal programming resources are limited, CentraXX’s Workflow Designer can be used. This designer allows the easy compilation of individual processes with drag&drop functionality. CentraXX standard masks are used for this, including self-designed forms with the form engine. The CentraXX product family comprises modules/functional modules that extend the core system CentraXX Basis as required and/or – modules that can also be used as independent products (CentraXX MDR, CentraXX RDA). Through the individual use of existing modules/functional modules, CentraXX enables clients to use tailored system solutions. System solutions which, for example, can be continuously expanded or adapted to meet increasing requirements. In practice, the establishment of data integration centres will create the technical and organisational prerequisites for cross-location data exchange between clinical and biomedical research. However, the connection and semantic processing of the data is also important for setting up data integration centers. For this reason, the essential contexts of the data and the collection thereof are also stored in CentraXX and produced for systems that are not able to do so. CentraXX is secure in all this because it is equipped with the latest encryption and data security mechanisms and its security architecture “made in Germany” implements all aspects of the complex German data protection laws. The integration of established tools puts CentraXX and its users on a secure legal basis. These include the tools E-PIX (identity management), gPAS (pseudonym administration) and gICS (consent management) developed by the Institute for Community Medicine (Department VC) and provided by the MOSAIC project (www.mosaic-greifswald.de), but also the Mainzellist (identity management, www.mainzelliste.de) implemented by the Mainz University Medicine. CentraXX also has an extensive and flexibly expandable interface structure. CentraXX is currently equipped with the HL7 interface standards and supports IHE and XML. In addition to the REST interface, the system also offers a trust interface (CXX-THS) and the CentraXX-CentraXX interface (CXX-CXX), which establishes the connection between the “Research-CentraXX” on the one hand and the “Treatment-CentraXX” on the other. Further interfaces such as those to liquid handling platforms, ultra-low temperature freezers and scanners are available. CentraXX uses the most modern Java and framework technology with open source frameworks such as “Vaadin” or “Spring”, and can also be operated as a cloud solution. Based on a web concept, every authorized user has access to the latest data and development status of the system, independent of location. In combination with the integrated modules “Raw Data Archive (RDA)” and the “Meta Data Repository (MDR)” CentraXX offers the comprehensive and necessary IT solution for personalized medicine. CentraXX helps collect, integrate and structure a wide variety of data points. Thanks to its integrated workflow engine, the most individual work processes can be orchestrated and optimized. On the one hand, errors due to defective or forgotten work steps in the course of the study documentation or during sample processing are excluded. On the other hand, all documentation steps are accelerated, displayed transparently, and made auditable. Detailed information about CentraXX Basic can be found on the product sheet.
. Because: Now is the time! based on the latest Java and framework technology, CentraXX builds on the standard of future IT supply instead of endlessly maintaining ineffective structures. because the system includes the entire stock of data from research as well as treatment and is structured in a largely uniform way to enable complete semantic evaluations for the first time. because it often transforms historically grown isolated applications into an easily processed, modern system and after a short training period also allows non-IT experts to access the full potential of eHealthcare. because it not only allows a certain perspective on research and treatment, but also orchestrates the work of all participants on a platform and makes their work results transparent for everyone. Data from various sources such as LIMS, HIS, KAS and PACS can be included in a uniform platform for all departments to share.